Home Adventure You Are the First Kid on Mars! You Are the First Kid on Mars! 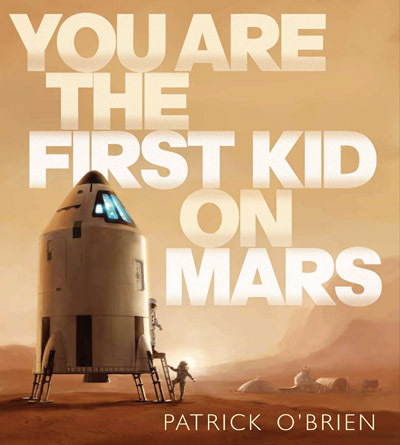 For an out-of-this-world space adventure that’s sure to leave you breathless (and weightless, too), be sure to read, You are the First Kid on Mars, by Patrick O’Brien. O’Brien unleashes his imagination and gives readers a wonderfully-detailed account of an unforgettable trip to Mars, beginning with a wild ride on a space elevator. Readers discover what it’s like to explore a space station and observe how the earth’s blue sky fades to black once the spaceship reaches outer space. Readers get a first-hand description of how astronauts cruise through space at 75,000 mph; they see with their own eyes what their tiny space bedroom might look like if they were the first kid in space. They even get to see how our glorious earth looks from far, far away. This book’s story-line makes it a unique adventure, and O’Brien’s descriptions and the book’s colorful and life-like illustrations are sure to inspire America’s next generation of adventurous astronauts. For a winning picture for your science classroom or your child’s personal library, click on the icon on the right and order, You are the First Kid on Mars.